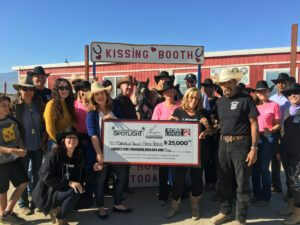 Coachella Valley Horse Rescue will use a large portion of a $25,000 Coachella Valley Spotlight grant to install an exterior lighting system, which will allow the organization to hold evening programs, and therefore expand its services and help more people. Coachella Valley Horse Rescue was founded in 1966 as the Indio Mounted Posse. Over the course of five decades, the organization’s name and mission has evolved, but always in-step with the changing needs of the community. Currently, Coachella Valley Horse Rescue offers care and housing for abused and neglected horses and then finds them safe homes. In addition, the organization offers programming, often partnered with other nonprofit organizations, that educates children and adults about animal cruelty and provides equine education that is therapeutic. “Once the horse-human connection takes place, the healing begins,” said Annette Garcia, director of Coachella Valley Horse Rescue. “Many of the people in our programs struggle with depression, behavioral disorders, attempted suicides and PTSD in veterans. As more people have learned about Coachella Valley Horse Rescue, they have wanted to participate in the programs, however some can only attend evening sessions. Lighting the arena will allow for that. The organization will also be able to offer evening sessions in the summer, when daytime hours are too hot to work with the horses. The Coachella Valley Spotlight partnership also offers recipients media exposure. Coachella Valley Horse Rescue was featured on CBS Local 2’s “Eye on the Desert,” in public service announcements and on the cbslocal2.com website throughout February. “We’re happy to partner with the Berger Foundation and Coachella Valley Horse Rescue enabling this valuable organization to expand their programming into the evening and also to inform our community about it,” said Mike Stutz, General Manager of Gulf California Broadcast Company, which owns and operates CBS Local 2. To learn more about Coachella Valley Horse Rescue, call 760-808-6279 or go to cvhorserescue.org.